We got delicate smoke and fruit on the nose (brambles, strawberry, blackcurrant jam) – standing by a driftwood bonfire on a rocky island shore while chewing Maoams. 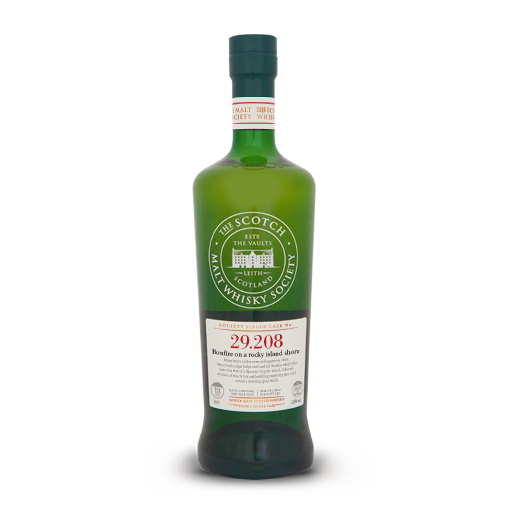 Tasting it removed any illusion of delicacy – intense smoke (fishing nets on that bonfire) and shovel-fulls of cigar ash – but intriguing acidic sweetness (reminiscent of Moffat toffees, mince-meat pies or balsamic glaze) brought satisfying sapidity to the smoke. The reduced nose found sea breezes, preserved limes, prunes and fig rolls. The palate – lemon on fruits de mer – everlastingly enjoyable. After seventeen years in bourbon wood we moved this to a first-fill American oak PX hogshead.